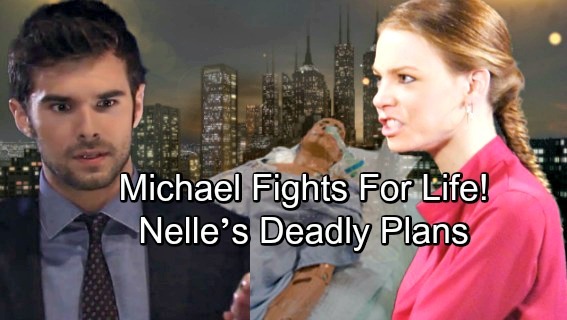 General Hospital (GH) spoilers tease that Michael (Chad Duell) may be a little too confident. He believes he’s got his plan all worked out, so he’s cautiously proceeding with Nelle’s (Chloe Lanier) takedown. Things have certainly been going well so far. Carly’s (Laura Wright) escape caused a minor hiccup, but Michael still managed to marry Nelle and keep his scheme on track. Of course, this just wouldn’t be a soap without a few twists! Michael seems to know what he’s doing, but that probably won’t be the case at all. Some new General Hospital spoilers certainly point to disaster. Before we get to the details, we should consider Sonny’s (Maurice Benard) worries. He’s a guy who’s used to danger swirling around him, so he doesn’t like plans he can’t control. Michael’s operating under the assumption that Nelle will behave exactly like he predicts. Since Nelle’s a volatile psycho, she’s bound to throw her hubby some curveballs. Sonny warned his son about the risks, but Michael thinks he can handle all this. Jason (Steve Burton) backed him up, but they could all have plenty of regrets soon. Let’s consider how this might play out. On July 27, Sonny will struggle to understand how it all went horribly wrong. In the episodes that follow, Sonny will feel both powerless and guilt-ridden. That makes it sound like Michael will actually land in harm’s way. Jordan (Vinessa Antoine) will have to assess some difficult circumstances on July 30. She’ll end up rushing to the police station, presumably to meet up with Chase (Josh Swickard). GH spoilers say Chase will hold himself at fault, so that can’t be good. Will he blame himself for letting Michael get hurt in the plot? Carly recently reflected on Michael’s time in a lengthy coma. He could find himself in another one before long. It’s possible Nelle will discover Chase and Michael’s secret partnership. If Chase slips up, Nelle may take matters into her own hands! She could shoot Michael or do something else that would leave him near death. Whatever the case, General Hospital spoilers hint that some unpleasant surprises are in store for the Corinthos clan. We’ll give you updates as other GH news comes in. Stay tuned to the ABC soap and don’t forget to check CDL often for the latest General Hospital spoilers, updates and news.